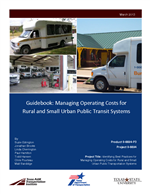 This guidebook is a resource for rural and small urban transit agency managers to use in better understanding, predicting, and managing operational costs. Doing so can improve the efficiency, effectiveness, and sustainability of public transit in the community served. The guide is presented in three parts: Part 1. Understanding Transit Cost Fundamentals; Part 2. Strategies for Optimizing Transit Costs; and Part 3. Tools and Resources.